The USA is renowned for having all things big and ostentatious, and the US ski resorts are no exception. Many of the USA ski resorts are mega-large and have over 1,000 hectares of skiing terrain. The associated profile of many of the US ski resorts is also large such that they have become household names in the skiing industry. Who hasn’t heard of Vail ski resort, Aspen, Snowbird or Deer Valley? There are many benefits to snowboarding or skiing in USA. Outstanding lift systems such that there are negligible lift lines, high annual snowfalls, fantastic facilities, and the classic high standards of US hospitality – why wouldn’t you want to ski in America? USA ski resorts are dotted across many of the states. Colorado skiing is probably the most well known with 27 resorts scattered across the Rocky Mountains. Examples of Colorado ski resorts include Breckenridge, Aspen, Telluride and Vail, and the family-friendly resorts of Keystone and Winter Park. The Utah ski resorts are great with many located close to Salt Lake City including The Canyons, Park City, Deer Valley and the famous Snowbird ski resort. Skiing in Utah is particularly well suited to powder hounds because the powder is light and fluffy, and the snow falls in abundance. Or you can ski California at well known resorts such as Heavenly, Squaw Valley and Mammoth Mountain. Northern ski states include Idaho, Washington, Montana and Wyoming. Expert skiers should head to Jackson Hole in Wyoming. This challenging mountain is on steroids. Although many of the US ski resorts are in the west, there are also lots of ski areas in the Eastern United States (e.g. Killington and Sugarloaf). Due to perceptions regarding inferior snow conditions, these Eastern ski resorts aren’t commonly visited by international visitors. There are also Alaska ski resorts, but many people only tend to visit these if they (or their partner) are also there to go heli skiing. Examples include Alyeska near Anchorage, or Mt Eyak in Cordova. If you’ve had your fix at the US ski resorts and want to revel in the backcountry, helicopter skiing and cat skiing are a superb way to ski or board fresh powder without having to “earn your turns”. Alaska heli skiing is world renowned. Alaska has a high concentration of heli-ski operations, particularly around the Chugach Range near Girdwood, Valdez and Cordova. Most heli skiing packages are multi-day, and they generally cater to experts who make the most of the steep slopes that can be tackled due to the relatively stable maritime snowpack. In the lower 48 states, there are only seven helicopter skiing companies. See our US heli skiing overview for more information. There are plenty of Colorado cat skiing opportunities, and at least eight other states also offer snowcat skiing. Many of the US cat skiing companies are located next to or close to ski resorts, so they’re easy to get to. See our USA cat skiing overview for more information. 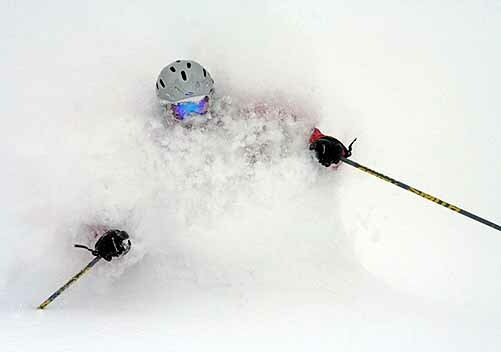 Powderhounds will not be disappointed with the amount of snowfall in the United States. When it comes to the statistic of average annual snowfall, 12 US ski resorts sit in the top 20 in the world. The abundant snowfall is partly due to the north-south orientation of some of the mountain ranges. Aleyska receives a whopping 18.3 metres (720 inches) of average snowfall per year. Kirkwood in California has a stat of 15.2 metres, and there are various Utah ski resorts that receive 12.7 metres (500 inches) annually. The stats alone are enough to get a powderhound drooling! See the skiing USA comparison page for more information. Other than just skiing and snowboarding, ski holidays USA can also provide a myriad of other winter activities for entertainment during the day and après ski. Another benefit is the caliber of shopping opportunities on offer at many of the USA ski resorts. Get that Amex card primed! You can ski USA and enjoy the great skiing and snowboarding across a huge variety of terrain. Many of the US ski resorts are really large, so you won’t get bored with the skiing. Thankfully the resorts are big, because you’ll need to ski or snowboard hard to work off all the calories from the generous American portions of food that may be served up to you! Enjoy!